That means using a number as name is NOT allowed! When a name still begins with a numeric character, then the name will be interpreted as array index. This is okay for dynamic index-based read access inside actions but not for defining elements. Internally all names will be converted to lowercase to allow case insensitive access! The devices attribute in the xml has a special functionality. It can be defined on each xml element. When the xml file will be parsed and transformed into the krpano internal data structures, then each xml element will be first checked for its devices attribute. And when the current device doesn't match the settings in devices attribute, then this xml element and all its sub/children-elements will be skipped. For checking devices dynamically by actions, use the device object. The devices value can be either just one device string or a combinations the severals device strings. Several devices need to be combined by logical operators. and the exclamation mark ! as NOT operator. This is the root element of a krpano xml file. All further elements need to be defined within this element. Information about the krpano version that was used when creating the xml file. This is only an optional information value, but it should be still defined to allow handling potential compatibility-related version changes. The background color. For partial panos / flat images where the background of the viewer becomes visible. When not set or set to an invalid value - no background shape will be used, and it behave 'transparent' and shows the viewer default background color or the html page when using the wmode="transparent" embedding setting. When set, it also allows using the mouse 'outside' the pano image itself (to navigate when using partial panos). And it also allows correct blending between differently sized partial panos. This can be used to split up the xml defintions into several files, e.g. for reusage of certain settings. The include element itself will be replaced with the loaded content of the included xml file. This can be a spherical, cylindrical or a cubestrip (1x6,6x1,2x3 or 3x2) image. When a partial pano image will be used, then the hfov / vfov / voffset settings from the <image> element will be used. With the <image> element in the xml (or inside a <scene> element) the TYPE, the SIZE and the PATHS to the images files of the pano will be defined. HTML5 Notes - in the HTML5 viewer only CUBE and CUBESTRIP images are supported! Additionally due several technical limitations, cubestrip images should be only used for small images - the typical usage would be preview images. Defines the paths/urls for a cubical pano image. The roll / rotation of the view camera. Note - all <layer> / <plugin> elments will be placed inside this area. To place a <layer> / <plugin> elment outside of the area, set the parent attribute of the layer / plugin element to "STAGE". The x-distance from the align point to the area window. The y-distance from the align point to the area window. The distance from the left edge of the screen to the area window (= the left border). The distance from the top edge of the screen to the area window (= the top border). The distance from the right edge of the screen to the area window (= the right border). The distance from the bottom edge of the screen to the area window (= the bottom border). Set the maximum cube image pixel size. Larger images will be automatically downscaled to this size. This setting works only with html5rendermode=1. It should be used only together with the devices setting for certain devices and situations. 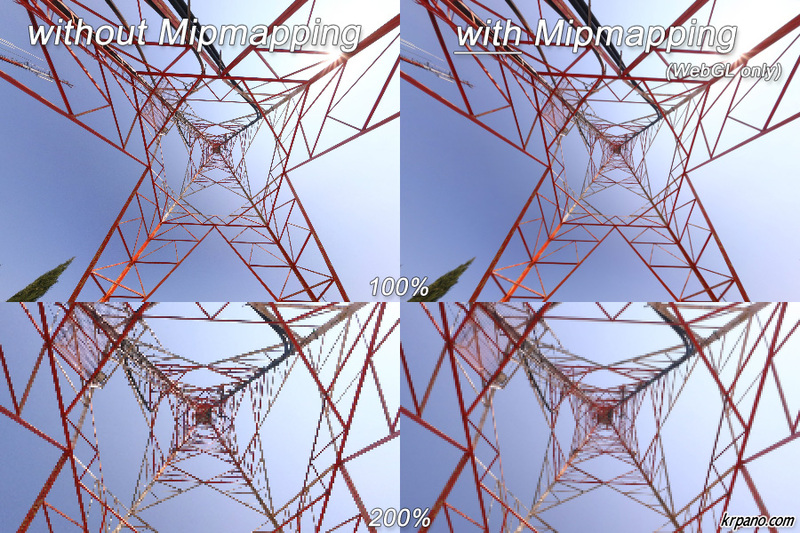 Mipmapping can give a better visual quality and reducing aliasing. The usage of mipmapping is only possible when the size of a cube-face-image is 1024px, 2048px or 4096px. Automatic mode - enable mipmapping automatically when the size of a cube-face-image is 1024px, 2048px or 4096px disable it when not. 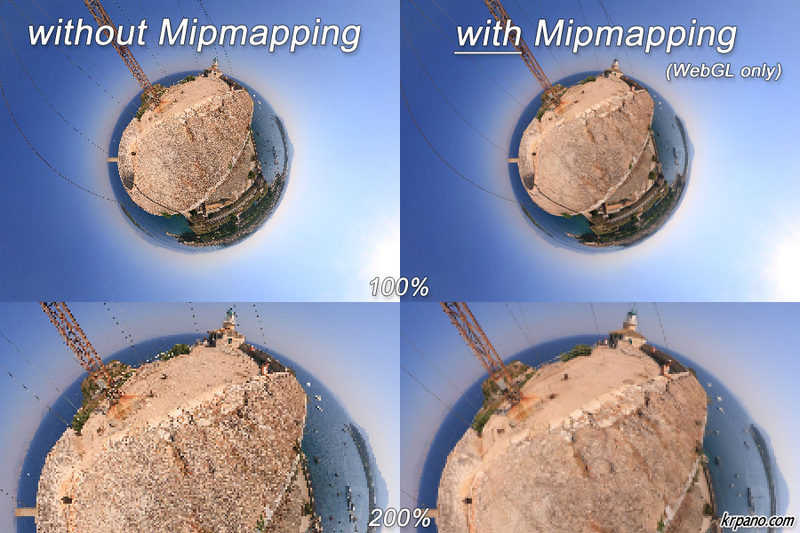 Force the usage of mipmapping - this will be done by automatically resizing the cube-face-image to 1024px or 2048px (depending on which size is more near). Note - the automatic resizing can cause a short delay on loading. The count / number of all layer/plugin elements. Enable/disable the whole layer/plugin layer for receiving mouse events. Show/hide the whole layer/plugin layer. Controls the transparency / alpha of the whole layer/plugin layer. Actionscript 3 Sprite object of the layer/plugin layer. The name of the current layer/plugin element (see the name notes). The index of the current layer/plugin element. Type of the layer/plugin element. image - the default, when using the url file as image. container - use this layer/plugin as container element for other layer/plugin elements. The layer/plugin element need to have width and height settings. The container element can have a single-colored background, which will be controlled by bgcolor, bgalpha and bgcapture. An 'alternative' path/url for the layer/plugin image file for the krpano HTML5 viewer. When setting the alturl setting, the normal url setting will be overwritten in the HTML5 viewer - that means, declare the alturl always after the url setting. This can be used to use an alternative image, e.g. an animated gif instead of an animated flash. Should this layer/plugin element be kept or removed when loading a new pano. Visibility of the layer/plugin element. Enables the layer/plugin element to receive mouse events. When set to "false" then the mouse events will be routed to the underlying elements. Show a hand cursor when mouse is over the layer/plugin element. Deep / 'Z' ordering of the layer/plugin elements. This value can be any string or number. All layer/plugin elements with a zorder setting will be sorted by the given value. When nothing is set - then the order is undefined and depends on the loading/finishing order of the browser. When enabled=true and capture=true then the mouse events will be only sent to this layer/plugin, no movement / controlling of the pano is possible. When enabled=true and capture=false then the mouse events will be sent to the layer/plugin and also to all underlying elements, controlling the pano will be still possible. Enables the children elements of the current layer/plugin element for receiving mouse events. Preload the layer/plugin url before loading the pano and before executing any actions. This can be used to force some element to be there and ready before everything else starts. This can be used to reduce the xml code - the attributes that are the same for more layer/plugin or hotspot elements can be stored together at one place in a <style> element. To specify more than one style, separate the style names by pipe | characters. Alignment / origin-point position of the layer/plugin element on the screen. Edge / anchor-point of the layer/plugin element. Offset / parallel-shift of the layer/plugin element. This values will be added to the x/y values. This can be a absolute pixel value or a relative (to layer/plugin size) percent value. Rotation of the layer/plugin element in degrees. Destination size of the layer/plugin element - the image will be scaled to that size. Negative values - when using negative values as size, then the resulting size will be the size of the parent element (or the size of the stage when there is no parent) without the given negative value. Scaling of the layer/plugin element. HTML5 Notes - since iOS 5 it's also possible to use floating point precision for positions and sizes on iPhone/iPad and co., set accuracy=1 to use that. Alpha value / transparency of the layer/plugin element. Defines a grid in pixel coordinates that splits the layer/plugin image into 9 segments. And when scaling the layer/plugin via the width / height / scale values, the 'edge' segments will be kept unscaled and only the 'middle' segments will be scaled. Assign the current layer/plugin to be a child element of an other layer/plugin or hotspot element. The assigned layer/plugin will be aligned inside the parent element. STAGE - this parent allows to align a layer/plugin OUTSIDE the pano area. BGLAYER - this parent allows to align a layer/plugin BEHIND the pano. Should a child layer/plugin element, that have been assigned by parent also be scaled when the current layer/plugin element will scaled. Use an other layer/plugin or hotspot image as mask. The image should have an alpha channel (e.g. use a .png image for it). Without alpha channel the bounding box area of the layer/plugin will be used as mask. Apply bitmap effects to the layer/plugin image. Background color of the container element (only available when type="container"). Transparency / alpha of the background color of the container element (only available when type="container"). Capture mouse events on the background of the container element (only available when type="container" and bgalpha > 0.0). A boolean read-only variable that indicates that the layer/plugin is currently loading an image. A boolean read-only variable that indicates that the layer/plugin has loaded the given image. A boolean read-only variable that indicates that the mouse cursor it currently over the layer/plugin. A boolean read-only variable that indicates that the mouse button was pressed on the layer/plugin and is still hold down. Actions / functions that will be called when the mouse moves over the layer/plugin element. Actions / functions that will be called in intervals (15 times per second) when the mouse stays	over / hovers the layer/plugin element. Actions / functions that will be called when the mouse moves out of the layer/plugin element. Actions / functions that will be called when there is a mouse click on the layer/plugin element. Actions / functions that will be called when the mouse button will be pressed down on the layer/plugin element. Actions / functions that will be called when the loading of the layer/plugin image is done. Flash: Actionscript 3 Loader object of the loaded layer/plugin image. Flash: Actionscript 3 Sprite object of the layer/plugin element. HTML5: HTML DOM element (div) of the layer/plugin element. An action of the layer/plugin element to load interactively settings from a <style> tag. The registercontentsize action can be used to set / register the 'original / source / unscaled' size of the layer/plugin element. By default the imagesize or the size of the swf file will be used - this source size can be changed here. Updates / recalculates the position and size of the layer/plugin immediately (normally this will be done automatically with the next screen refresh). After calling this actions the pixelwidth and pixelheight variables will contain the final pixel sizes of the layer/plugin element. An action to change the alignment and edge of a layer/plugin element without changing its current position. The x/y values will be recalculated to keep the current position. A function that returns the full path/name of the layer/plugin element. Because of the return value this action is only callable from the plugin interface. When set to 0 the pixel positions will be rounded to full pixel values. This avoids jumpy movements when changing the rendering quality of the Flashplayer. When set to 1 (the default), the screen position-coordinates will NOT be rounded to full pixel values. When set to 0, the screen position-coordinates will be rounded to full pixel values - this can be used to avoid blurred hotspot image/texts in browsers, which are supporting sub-pixel-coordinates. Defines a grid in pixel coordinates that splits the hotspot image into 9 segments. And when scaling the layer/plugin via the width / height / scale values, the 'edge' segments will be kept unscaled and only the 'middle' segments will be scaled. Should a child layer/plugin element, that have been assigned by parent also be scaled when the current hotspot element will scaled. A storage / collection element of attributes for layer/plugin or hotspot elements. When a layer/plugin or hotspot has its style attribute set to the name of a style element, then all attributes from that style tag will be copied / set to the layer / plugin / hotspot element. Inside the action xml element itself, a sequence of actions calls can be placed. When the action will be called, then these action calls will be executed one after the other. Enable/disable the caching of all other (not pano image related, e.g. layer/plugin and hotspot) files.